Every once in a while one of our members gets to travel abroad and experience some new and exciting calligraphic experience. This past September, Margaret Chan went to Italy. In the following article, Margaret shares her experience of the seminars she took. In April 2016, I received an email from the Westcoast Calligraphy Society about an opportunity to go to Italy to learn calligraphy. l’ve always wanted to study calligraphy under the direction of calligraphers from other countries and to be able to do it in Italy seemed really to be a dream come true! I had just lost my dog of 15 years at the time and thought doing something like that to treat myself would help me get through the grieving. So I contacted the organizer of Turin Education Consortium and signed up. 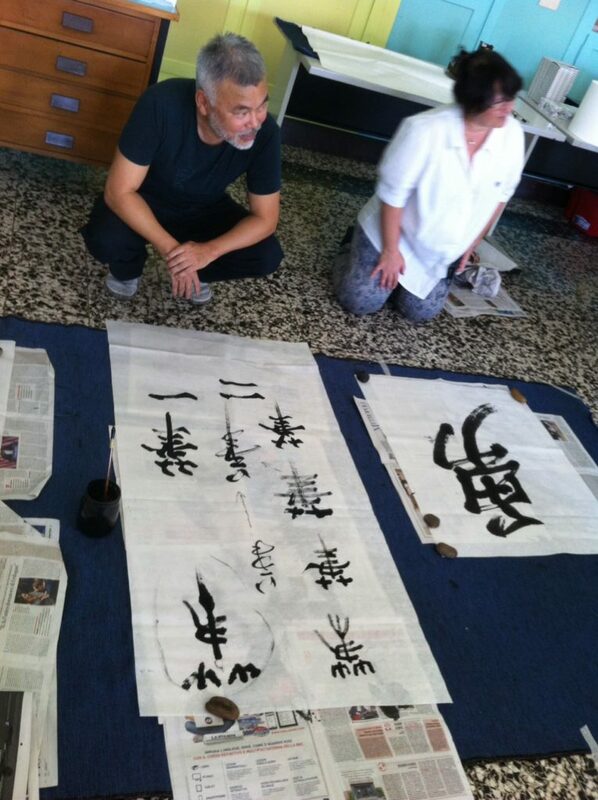 The workshop was titled Sign and 8pace: Conversation between Cultures Through the Art of Calligraphy took place in Turin, Italy from September 3 to 11, 2016. It consisted of two seemingly very different workshops. The first was on traditional Eastern Calligraphy Shodo taught by Norio Ngayama. The second was a Western expressive/experimental calligraphy taught by Monica Dengo. Participants had the option of enrolling in either one or both of these workshops. I enrolled in both. I arrived into Turin on the evening of September 2 at the Collegio San Giuseppe campus, located in the city center. Accommodations were made available to participants of the workshop right on campus. The facility has been upgraded since it was built back in 1875. They are basic but clean and safe. Participants to the workshops came from all over the world: two from UK, one from Norway, one from Russia and the rest were from different parts of Italy. And then there was me, from Canada. In total, there were about 15 participants who are artists, calligraphers and educators. know exactly what to expect from the workshops. Norio’s workshop started with a demonstration by Norio on Shodo calligraphy demonstrating the transition from the formal uniform style to the expressive, non-uniform style. Each participant began by learning the basic strokes later used to construct individual characters. Most of the participants had no experience with brush for calligraphy but by the end of the first day, a lot of us had a pretty good handle on the writing instrument. The final session of Norio’s workshop began with Norio’s demonstration of the cursive form (gyosho), a style that was primarily based on calligrapher’s expression. It started with everyone doing breathing exercises to get participants in touch with his/her inner “chi”. Then Norio stood quietly in front of a blank piece of rice paper with an even larger brush already loaded with ink, seemingly waiting for that moment to arrive. Suddenly his brush started to move with tremendous emotions as if there was a spiritual guide moving it across the paper. One could hear Norio grunting as the character began to take shape. Every participant was then asked to select a character of his/her choice for work on an expressive (gyosho) version. 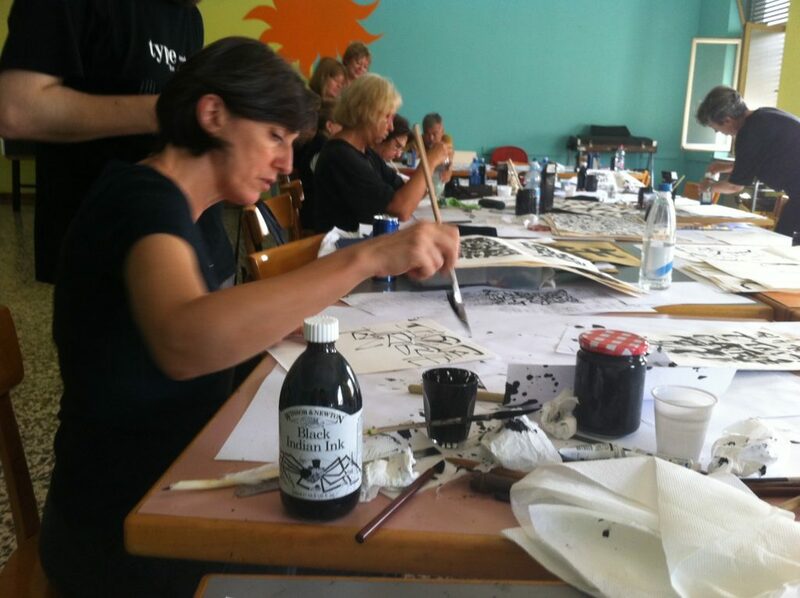 The second workshop taught by Monica Dengo began by the introduction of a unique technique using a “cola” pen. Using this special pen, different textures can be achieved by applying different pressure and speed. Participants started with a phrase of his/her choice and wrote it using only capitals. They would then experiment by writing the same phrase connecting the letters of random sizes and directions. Emphasis would be on design using lines and space rather than legibility of the text. The results were stunningly pleasant. Through Monica’s encouragement in using personal styles and expressions, participants’ work was all unique and entirely personal. At the end of the workshop, each participant was able to create very impressive pieces which were later bind into a book. I would like to conclude this article by mentioning that the organizer for this workshop did a tremendous job in making sure that the participants were well looked after. Aside from the learning, walking tours and museum visits were included in the workshop itinerary. Turin is a charming little city that deserves much more attention. The locals are friendly and as charming as the city itself. Gelato, coffee and chocolates are all part of the attractions of this beautiful city. I would visit this city again in a heartbeat. Thinking About Taking a Gap Year? You’re Not Alone.